About and/or Buy my music! There has been another Baby Taylor Signing….. 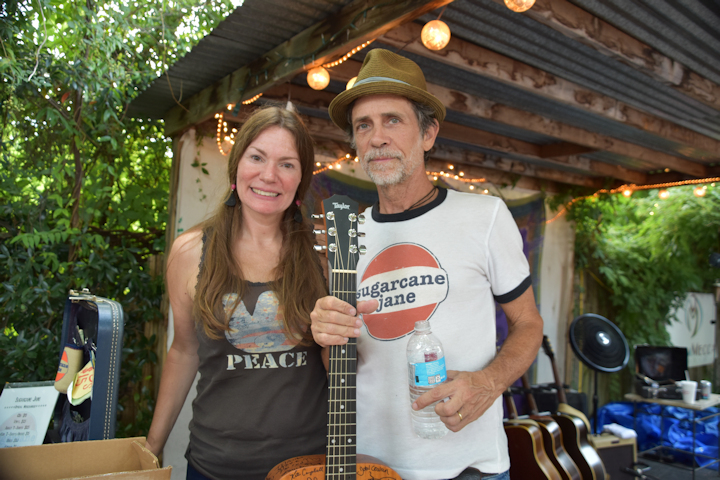 Signing number 75 & 76: Sunday, August 12, 2018: Sugarcane Jane performed at Daniel Day Gallery in Birmingham. WOW! Savana Lee Crawford & Anthony Crawford pose after signing the Baby Taylor. Signing number 72, 73 & 74: Saturday, August 29, 2015 Runaway Home was our guest for a fabulous evening at Small Stages in Birmingham. I got to open for them at Moonlight on the Mountain a couple of years ago, so I already knew they did good show! Gary Culley, Malinda Fields & Mark Elliott signing the Baby Taylor as I watch. Thanks to Mark Westfall for the photo! Signing number 70 & 71: Sunday, June 7, 2015 Butch Hancock and his son, Rory Hancock gave us a wonderful afternoon concert for Small Stages in Birmingham. Butch Hancock and son, Rory Hancock, autographing the Baby Taylor. Signing number 69: Friday, August 1, 2014 Will Kimbrough with Brigitte DeMeyer were at Moonlight On The Mountain for another great show! Will Kimbrough autographing the Baby Taylor. Signing number 68: Friday, May 23, 2014 at THE festival… The Acoustic Cafe… Ray Wylie Hubbard did a great show!! And he autographed The Baby Taylor! FUN night! 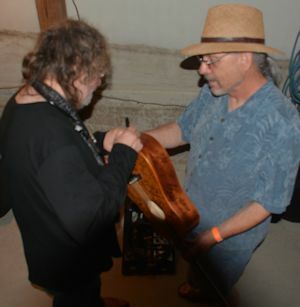 Ray Wylie Hubbard autographing the Baby Taylor. Thanks to Philip Eggers for the photo. Signing number 67: Saturday, March 29, 2014. It was a night of fun and friends and great music at the “Stately Uppity Manor” of Jay & Leanna Randall with Kevin Welch. area, he is also a very good musician and singer/songwriter in his own right. What a priviledge it is to get to play at Berkeley Bob’s! Signing number 65: Friday, May 24, 2013. Everybody knows that I am a big fan of The Acoustic Cafe. This years festival was big, but still not as big as the year when Doc Watson was the headliner. But it was still a hoot! And I got to meet Todd Snider. What a show! You should have been there! Visit www.ToddSnider.com for more about Todd. Signing number 64: Friday, May 25, 2012. I’ve been to every Acoustic Cafe except the very first one (I didn’t know about it then). It just gets better every year! The act to get the most attention this year was The Carolina Chocolate Drops. Their Friday night show was great! THANKS to Philip Eggers for the photos! now!! John used to be the keyboard player for Wet Willie. and Bassist Mark Brewer at Wine’d Down in Birmingham. Jeff Black and The Jim Hurst Trio. I previously met Jeff Black when he did a show for Small Stages and I’d seen Jim Hurst at previous Acoustic Cafe shows. Signing number 60: Saturday, September 10, 2011. Birmingham NASI and Vestavia Hills Baptist Church sponsored a songwriting seminar with Pat Terry. seminar / nice show / nice guy!! Pat Terry adding another autograph to the Baby Taylor. at Danielday Gallery / Dream Mecca Studio in Birmingham. Kent DuChaine adding his autograph to the Baby Taylor. Color Cafe in Springville. They do a show you need to see! 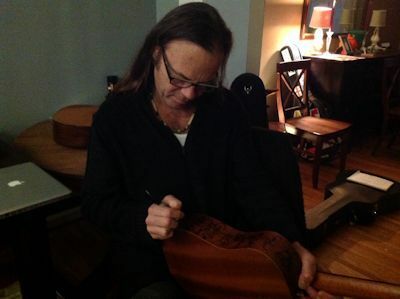 Kent Peterson signing the Baby Taylor. an early 70’s Macon, Georgia / Capricorn Records’ group. Man, what a picker! Tommy Talton signing the Baby Taylor at Moonlight On The Mountain. music star Claire Lynch!! What a treat!! Claire Lynch signing the Baby Taylor. song “Pot of Gold” for my next CD! Robby Hecht signing the Baby Taylor. House. What a bonus… I got to open for him!! He turned BBQ into a joke. Looking on as James House signs the Baby Taylor. Signing number 53: Saturday, May 23, 2009. A few sprinkles of rain didn’t put a damper on this years Acoustic Cafe! (Sorry, I couldn’t resist). Amoung several really good performers was John Cowan. Great show!! John Cowan playing the Baby Taylor. was Charlie Louvin… yes, one of the famous Louvin Brothers. Charlie Louvin signing the Baby Taylor. Artist for another Small Stages Show – www.SmallStages.com. Michael Reno Harrell signing the Baby Taylor. 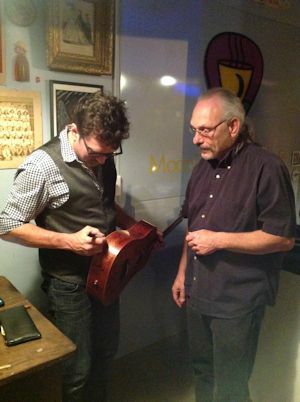 Pete Kennedy signing the Baby Taylor. that Jack’s in town, don’t miss it!! Jack Williams signing the Baby Taylor. Jesse Winchester fan as I am!! Tom Kimmel signing the Baby Taylor. in the Birmingham area! Catch his shows whenever you can! Dan Farmer after signing the Baby Taylor. Cafe. What a great ending to a perfect day! Peter Rowan signing the Baby Taylor. International then performed at Vestavia Hills Baptist Church. Kate Campbell signing the Baby Taylor. Kristofferson at The Alys Stephens Center in Birmingham. and Sara at the Alys Stephens Center!!! 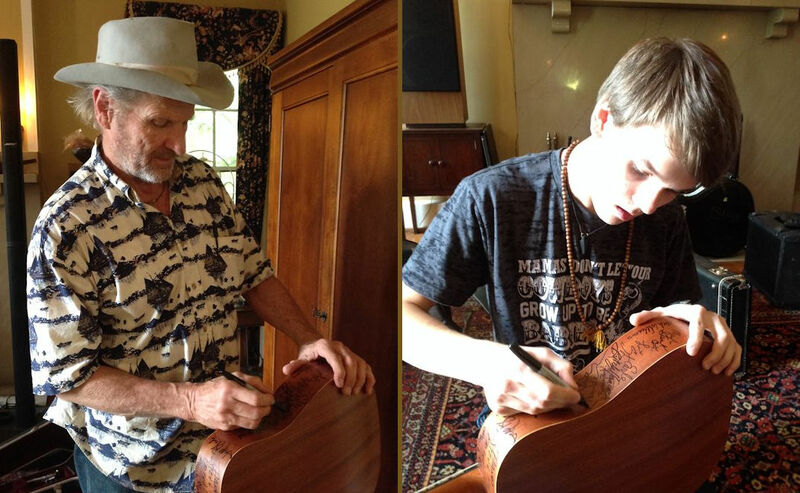 Kris Kristofferson signing the Baby Taylor. ladies who’s names I do not know, Joan’s autograph is now on the Baby Taylor!! Thank you Alys Stephens Staff!!! Joan Baez holding the Baby Taylor. THANK YOU to Crook Stewart of Crook Stewart PROduction for the photo! and lead guitarist for Hank Williams, Jr. for 20 years. Lamar Morris autographs the Baby Taylor. Taylor. Dave is not only a great performer, he’s first and foremost a great person! workshop!! Another treat thanks to Dan and Scott! Guitar Gallery for the picture! Tony Rice autographs the Baby Taylor outside The Bama Theatre. Thanks to Wayne Messick for the picture. friend in the lobby… Glenn Tolbert, the fastest picker in Alabama! Glenn Tolbert signing the Baby Taylor in the lobby of The Bama Theatre. hoot! And he’s a nice guy to boot! Monte Montgomery checking out other autographs before signing the Baby Taylor. Thanks to Charlie Holliday for the picture. Chris Proctor autographs the Baby Taylor. Thanks to Philip Eggers for the picture. a really great show at Moonlight Music Cafe in Birmingham.. Thanks to Judy Daussman for the picture. it too! Yes, a lot of my friends know that I am easily entertained. Robert Earl Keen tuning the Baby Taylor. Signing number 31: Saturday June 18, 2004, at Birmingham City Stages ’04. Another one of the musical stars from “Oh Brother” and beyond, Dr. Ralph Stanley. and polite at the after the show ‘meet and greet’. 30 years at Fretted Instruments of Birmingham (www.FrettedInstruments.com). one of those fun Taylor Guitar Clinics… this time with Beppe Gambetta! James McKinney to sign the Baby Taylor! Del McCoury autographs the Baby Taylor. Saturday, May 25, 2002, Sam Bush was the headliner. What a GREAT show!! Bill attached saying that Bill was willing to sign the Baby Taylor. Somehow….. I need to meet this guy “Bill” and figure out how he did this!?! If I had photos, Jerry and Dan would be shown here! Signing number 14, Tuesday, November 6th, 2001 at Zydeco in Birmingham. Mac McAnally website at http://www.macmcanally.com. Doc for a few minutes. Overall, Life is good! Birmingham on the UAB Campus. Nanci performed with The Alabama Symphony. went with Judy and me to see Guy Clark at Zydeco in Birmingham. He appeared with Verlon Thompson and they put on their usual GREAT show. The Official Guy Clark webpage is at www.guyclark.com. Doyle Dykes autographs the Baby Taylor. 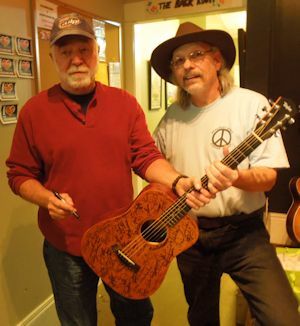 Jesse Winchester (left) autographed the Baby Taylor after the show.